This entry was posted in carbon reduction, Energy. Bookmark the permalink. This is a great offer. Glendevon have recently fit­ted us with sol­ar thermal -3m sq of evac­u­ated tubes on roof with south­erly aspect and large fam­ily sized tank and we are really pleased with it. Since October we have been gen­er­at­ing approx 4 kw/day (expect that it will be much high­er in sum­mer). It doesn’t take much to work out that the sys­tem will (even­tu­ally) pay for itself if/when the R.H.I. comes into play this com­ing year. Was advised by Edinburgh Council that plan­ning per­mis­sion was not nor­mally required as long as the panels/tubes are more than 1m away from roof edge and don’t pro­trude more than 20mm from roof plane. Though slimmer/smaller h.w.cylinders are avail­able for smal­ler house­holds the thermal hot­water cyl­in­der is lar­ger and heav­ier so some care­ful con­sid­er­a­tion is needed when work­ing out where to place it (300l tank full of water = approx 50stone ) . How can we be sure that the sol­ar pan­els pro­posed by Glendevon Energy are the most effi­cient or the most cost effect­ive. As I am an aca­dem­ic in Electrical Engineering, I would be happy to look at the bench­mark in per­form­ance that this com­pany is sup­ply­ing. 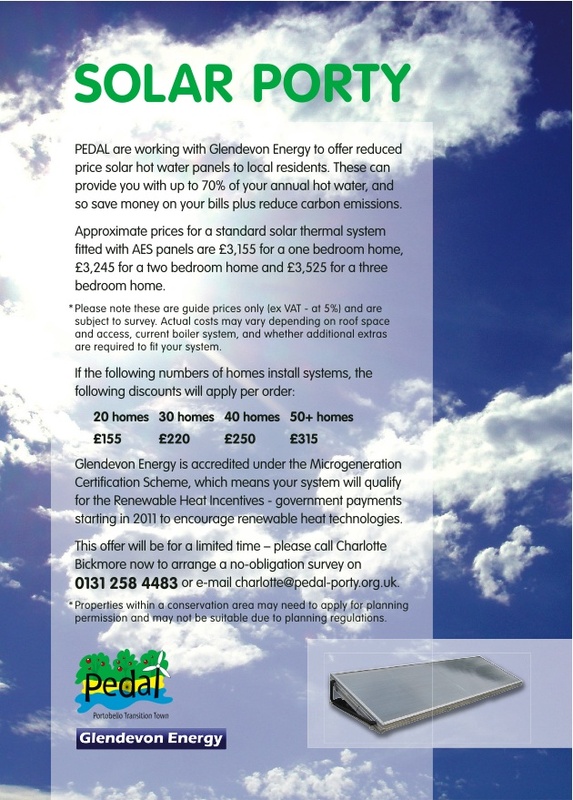 We went through a tender pro­cess and invited installers to pro­pose pan­el types based on a num­ber of cri­ter­ia, includ­ing price, energy per­form­ance in Scotland, where the pan­els were pro­duced and also com­pared the exper­i­ence of these installers with sim­il­ar pro­jects. The AES pan­els which were pro­posed by Glendevon were the most cost effect­ive ones pro­posed. Vacuum tube sys­tems, which are also avail­able through Glendevon, are slightly more effi­cient, but also cost slightly more, so effi­ciency in this case means that they can be fit­ted on smal­ler roof areas. We are con­fid­ent that these pan­els per­form well and are very well priced. I hope this answers your ques­tions, but if you would like to speak to Glendevon dir­ectly, or if you would like to see the tenders that came in you are very wel­come to do that.